What is Orienteering, and Why Should I Learn it? 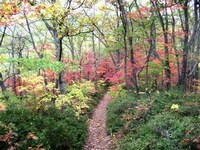 Orienteering is the ability to find your way around unfamiliar territory using a map and a compass. Orienteering is a useful skill whether you are in a city or a forest, and is a major component of several sports, such the equestrian sport of TREC, competitive orienteering and geocaching. But, many other people find some orienteering knowledge helpful. 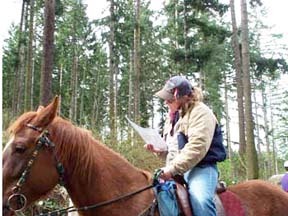 Hikers, mountain bikers, and equestrian trail riders are the largest group of people who benefit from knowing how to orienteer. There are thousands of miles of trails available to these groups but many people do not venture out as they would like for fear of getting lost. Even though public forests will often have trails marked, it can still be confusing and intimidating, and it’s not uncommon for signs and markers to fall or be removed by unauthorized people. Sure, you can take along a phone with a tracking/map app or GPS unit that will track you, and many phone apps have the ability to download maps ahead of time and save them to the phone so the app can show you in real time exactly where you are on the map even when there is no cell service. And those are wonderful and I use them a lot. But what if your phone dies? There are a number of reasons your phone may not be reliable. It’s not uncommon for the compasses in phones to be inaccurate, the battery may die, the phone may get wet (if it’s not waterproof), you may drop it while trying to look at the map and break it, it may even become unstable simply from the movement of the horse, depending on where you keep it stashed. The point is, phones are delicate electronic devices and it sometimes does not take much to upset them. It’s really not a good idea to totally depend on such a device. GPS units are often more rugged, but they also often have less features available, a smaller more difficult screen to view, and have a bigger learning curve. And what about those people who just have a hard time with electronics in general, especially the touchscreen variety? My husband is one of those people, and I know several others. So, for many people, while we will go out for long rides or hikes with people who know the trails, we are not so willing to go far in unfamiliar territory when there is no guide. Orienteering with a map and compass is far more reliable and less finicky than electronic devices and neither one will run out of battery power. 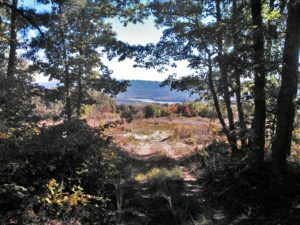 Once you understand how to read a topographical map and understand how an orienteering compass works and know how those two items work together, you will be able to plan a trail route in any area that has a trail system and be assured of getting back to the trail head in an acceptable time and manner. 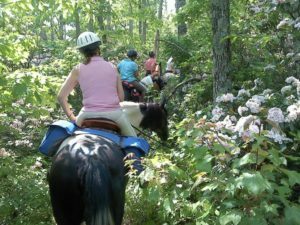 While I mostly concentrate on horseback trail riding, I have done clinics and classes with hikers, mountain bikers, girl scouts and boy scouts, so if you or your group would like to learn orienteering but do not ride, please feel free to contact me and we can still arrange some clinics or classes.